What is fire blight? Fire blight is the most destructive bacterial disease affecting plants in the rose family, including apple, pear, crabapple, hawthorn, cotoneaster, mountain ash, quince, rose, pyracantha, and spirea. It can kill or disfigure a tree or shrub, depending on the susceptibility of the host and weather conditions. A shepherd’s crook at the end of an apple branch caused by fire blight. What does fire blight look like? Blossoms, leaves, twigs, and branches of plants affected by fire blight can turn dark brown to black, giving the appearance of having been scorched in a fire. The blighted blossoms and leaves tend to stay on the tree instead of falling. Current year’s twigs often wilt and bend approximately 180°, forming a “shepherd’s crook.” Cankers develop on branches and stems, and emit a sticky bacterial ooze. Sapwood around cankers may discolor to a reddish brown. Where does fire blight come from? 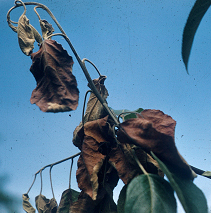 Fire blight is caused by the bacterium Erwinia amylovora, which overwinters on the margins of cankers and starts to multiply when temperatures rise in the spring. The bacteria-laden ooze from the cankers is dispersed by splashing rain, and insects. Bacteria multiply in blossoms and are carried to other plant parts where they penetrate through wounds and natural openings. They can also be spread through the plant’s water-conducting (vascular) system. How do I save a plant with fire blight? There is no cure for fire blight, but its spread can be limited. Prune diseased branches preferentially during the dormant season at a time when branches are dry. When removing diseased branches, prune six to eight inches below tissue showing visible symptoms. If pruning is required during the growing season, prune at least 12 inches below the diseased area. Always, disinfect pruning tools by dipping them for at least 30 seconds in 10% bleach or alcohol after each cut (spray disinfectants that contain at least 70% alcohol can also be used). Burn or bury diseased branches. How do I avoid problems with fire blight in the future? By far the most effective strategy is to choose plants with resistance to fire blight. Select a well-drained site with a soil pH of 5.5 to 6.5. Avoid applying high nitrogen fertilizer, which may stimulate succulent new growth susceptible to the disease. Treatment with Bordeaux mixture (copper sulfate) before buds open can be effective in reducing the amount of bacteria present on branches. Make one or two applications, with four days between applications. For more information on fire blight: See UW-Extension Bulletins A1616, A3565, A2072 or contact your county Extension agent. Thanks to Teryl Roper, Patricia McManus, and Patti Nagai for reviewing this document.